A brief survey of the designs of English cards in South America. A continuation of the survey of designs used in Central and South America. It is assumed that playing cards had been introduced to the Americas with explorers such as Columbus or Cortés. Argentinian playing cards have followed Spanish styles, based on models imported from Spain. Compañía General de Fósforos Montevideana, founded in 1893. Playing cards had been introduced to the Americas with explorers such as Columbus or Cortés, whose fellow countrymen were keen gamblers. Cards were imported from Spain since the 16th century. Local production usually imitated Spanish cards. 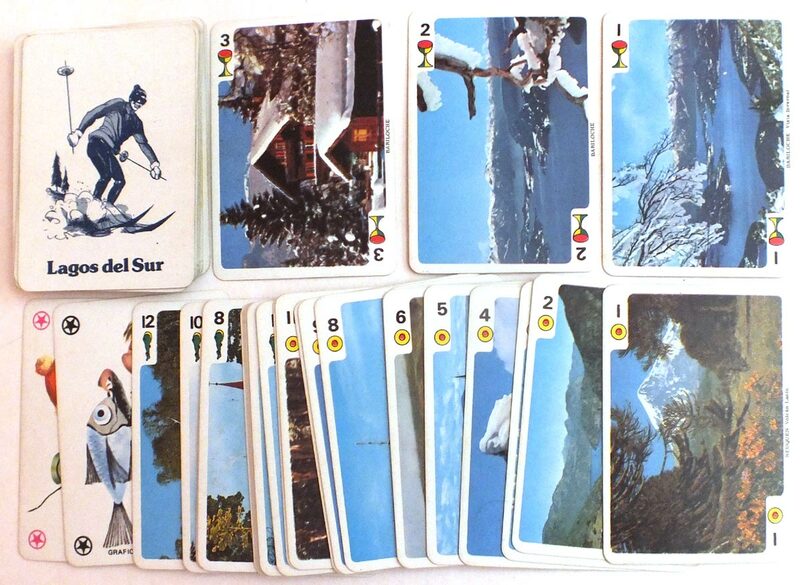 VIGOR S.R.L (1955 - c1975) manufactured a range of playing cards and card games, including "Chinita", "La Estrella", "Barcelonesa", "La Española", "Fantasio", "Las Rosas", "Pokerin" and special items such as "Cartas Gitanas", and a Hungarian "Seasons" pack. Belgian manufacturers were competing against Spanish makers. Features of the traditional Spanish designs, including many well-known brands, were imitated or plagiarised. Often they were anonymous so as to avoid importation duties in the destination country. Not a lot of playing cards have been produced in Panama, only a couple of locally-produced tourist souvenir packs. Cards of the Spanish National Pattern manufactured by Pedro Bosio, Genova (Italy) during the 18th century for export to South America. There has been very little playing card manufacture in Ecuador. Cards are mostly supplied from Colombia, Argentina & Spain. Known brand names include: Willy Wilson, La Raspa and El Heraldo. Some locally-made tourist souvenir packs are also known including Naipe Ciudad de Quito and Galapagos Islands souvenir cards. Playing cards manufactured by Joker S.A.
Spain has played a pivotal role in the history of playing cards in Europe and Latin America. Early documentary sources refer to games of cards in merchants' inventories, to various card-makers and to prohibitions of card games, mostly around Barcelona and Valencia, in the late 1300s and early 1400s.